With the presence of the mighty Himalayas, Uttarakhand is home to some of the most popular hill stations in India. Mussoorie and Nainital are the favourites among them. The famous Jim Corbet National Park is also situated in the state of Uttarakhand. The Valley of Flowers which is a UNESCO World Heritage Site attracts tens of thousands of travellers all across the globe. Known for its meadows of endemic alpine flowers, Valley of Flowers is one trek where many people begin their journey of trekking in the Himalayas. The Nanda Devi National Park is a home for rare species of large mammals and is rich in abundant flora and fauna. Uttarakhand often cited as the Dev Bhumi (Land of Gods), is a very popular pilgrimage center in India. 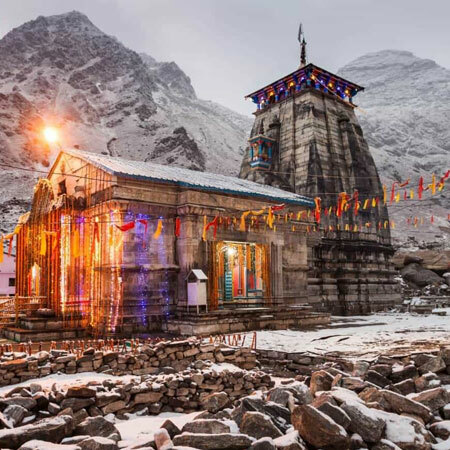 Uttarakhand has Char Dhams - Gangotri, Yamunotri, Kedarnath, and Badrinath, which are the four most spiritual pilgrimage sites of the Hindus and many ancient temples for you to pay homage. Uttarakhand not only attracts pilgrims but also entertain the adventure enthusiasts with limitless activities. Trekking, cruising, and skiing are some of them. To enjoy the longest cable car ride in India, Uttarakhand is a great option. Journey to Uttarakhand offers you with remarkable travel experience with full of pleasant and enjoyable moments. Though a small town, Almora does have its own charm and offers places of interest to its tourists. Right from the ‘Bright End Corner’ that offers best sunrise and sunset points to the popular ‘Zero Point’ which gives a panoramic view of the Himalayan Ranges, are a delight to visit and enjoy the serenity. On the other hand, the ‘Binsar Wildlife Sanctuary’ is a place to explore the forest area filled with pine and rhododendrons. Some of the animals spotted here are leopards, langurs and barking deer as well as a variety of birds for nature enthusiasts. Within Binsar also lies the Kasar Devi Temple, which is known for the adventurous ridge walk the area offers. It is also famous as the hippie hub in Almora. A completely different construction to that of the standalone building of Kasar devi Temple, is the ‘Katarmal Sun Temple’ that is built in complexes. It closely resembles the Sun Temple of Orissa. The main building here is dedicated to Sun god. The temple also has historical significance as it was built around 800 years ago. It continues to be one of the ges of Almora. Almora as a hill station showcases its art and craft through the local markets like the 200 year old Lala Bazaar that is known for its ethnic jewelries and clothes. Also the ‘Karkhana Bazaar’ has all sorts of metallic antiques and crafted items on sale. To give a better understanding of the things used and the lifestyle and culture of the people from the hills is the ‘Gobind Vallabh Pant Museum’. Overall, Almora becomes a place to relax and be at leisure amidst the mountains and simple lifestyle. Almora experiences temperate climate owing to its geographical positioning. During summers that are from March to June, the climate remains pleasant with temperature between 20° C and 34° C. July to September remains wet, while December to February faces snowfall as temperatures fall below 0° C. Also, October and November become the pleasant months with temperatures between 14° C and 24°C.